I cannot celebrate the triumph of violence, no matter the victim, for violence remains the only victor and humanity the perennial loser. If I find Him with great ease, perhaps He is not my God. If I cannot hope to find Him at all, is He my God? If I find Him wherever I wish, have I found Him? He has touched me with the finger that made me out of nothing. As I prepared to conduct a wedding recently, which was celebrated in the back yard of a family home, I was given pause to think about the ways in which our identities and values are formed. The impact of setting and place - the context for our experiences - is significant on our understanding of the world and our place in it. Where we are born, our early childhood experiences, and the people who impact our lives are seminal in shaping values and identity, giving shape to the ways in which we view the world. As those who live in the West, with access to a computer, we are clearly in the upper echolons of economic value in this world. Resources and opportunities are available to us which the majority of the world cannot imagine. Yet within our own subset, there is considerable diversity of perspective. This is due in no small part to the places where our stories were formed. I can think of a number of places where my sense of justice, value and identity were formed, and will reflect on these in the days to come. Are there particular places which stand out for you? In 1965, U.S. CEOs at major companies made 24 times a worker's pay -- by 2004, CEOs earned 431 times the pay of an average worker. From 1995 to 2005, average CEO pay increased five times faster than that of average workers. While CEO pay continues to increase at rates far exceeding inflation, wages for the vast majority of American workers have failed to keep up with rising prices. In fact, real wages for the 90% of Americans who earn under $92,000 a year have actually fallen since 2001. A rare stamp was sold overnight in Melbourne for $29000. 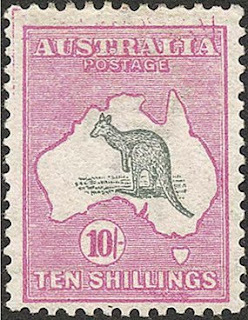 The stamp - a 1913 10/- purple stamp with a kangaroo standing over a map of Australia - normally sells for around $1000. This stamp was unique inasmuch as it contained a fault which caused a double-printing of part of its border. It's amazing, really, when we live in a society which pursues perfection with relentless ambition. Celebrities will often have photographs airbrushed to remove blotches before publication. This week we laud the perfect performances of athletes while many others pass in silence. When we make the inevitable comparisons between ourselves and those in the public domain, we clearly do not match up and tend therefore to undervalue our unique identity. This blemished stamp perhaps serve to remind us that is our unique faults which make us valuable in this world. While governments in the West continue to argue about the best ways to tackle the ever-increasing emission of greenhouse gasses into the atmosphere, we do well to note that the fastest growth in mobile phone penetration is currently happening in Africa and the poorer Asian nations, where the infrastructure for landlines is absent and the capital isnâ€™t available to invest. Mobile phones do not require the same extensive and expensive infrastructure in order to provide access, and are at home in a society which is used to production and consumption taking place locally. It is a lesson which should not be lost on us as we consider reducing carbon emissions. While the Victorian State Government has announced another brown coal-powered electricity generator, it perpetuates the mass-production in remote location approach which underpins most Western economies. A downside of this approach in electricity generation â€“ aside from the massive increase in carbon emissions â€“ is the loss of electricity in transmission, up to as much as 80%. On average we need then to produce at least twice as much electricity as is ever consumed at the point of delivery. Solar power, then, brings production and consumption to the same locality, reducing transmission loss. Here in the West, however, we are unlikely to adopt such a disaggregated approach to electricity supply. Poorer countries, on the other hand, may â€“ as with mobile phone penetration â€“ provide a much more creative response to the electricity needs of their communities. Introduction of solar power into such communities, while initially providing small stocks of electricity, may provide a basis for development which is both environmentally more responsible and with the capacity to grow as the minimal requirements of small communities expands. Here in the West, the cost is large in comparison with the marginal improvement in supply capacity, in contrast with the possibilities of subsistence communities. Such an approach should not only be feasible, but offer greater security than the current mega-production centres upon which the current electricity generation strategies are now based. There are more than enough rooftops available in any major city in this country which are available for solar panels. With over a million homes generating electricity across a wide expanse, the capacity can be obtained without further scarring the landscape, and at the same time provide a decentralised supply which is far less vulnerable to outages. Should one of our major generators falter, there would be serious disruption to supply. But solar panels on myriad rooftops offers similar continuity of supply as the internet â€“ interconnected nodes across numerous sites which can shift the load as needed. Loss of one panel provides minimal disruption, alongside the greater correlation between production and consumption quantities. Perhaps it is the African and Asian communities which offer the best alternative to alternative and environmentally friendly electricity, because they have much less invested in existing technologies. Might our aid and development organisations provide a lead here? 1. Never be afraid of failure. One of the first instructions I give to junior players is not to be afraid to make mistakes. None of us learnt to walk without the occasional stumble and fall, yet the only way to learn is by doing. When all is said and done, nothing of a training session is any value unless it is tried on the court during a game. I don't expect players to get it right the first time, and challenge them often to try something a bit different. 2. Don't be daunted by the size of the opponent. On the basketball court, a tall opponent presents obvious challenges. A recent U13 girls opponent was well in excess of 6 foot tall. Getting past the intimidation felt by the girls enabled them to focus on strategies and tactics which helped them turn the game. The taller opponent had a big impact, but their response enabled them to overcome, using their own capabilities in the face of a challenging opponent. 3. Art and Science. Much time is spent in teaching basic techniques, both individual and team. At the end of the day, however, when a player is on court, they have to make their own choices. The basic techniques hopefully lay a platform which gives them a range of choices and the capability to execute within a game situation. But a coach cannot call every play, or micromanage every game situation. Deciding which move to execute is an art which can be honed and encouraged, rather than managed. The range of moves can be expanded by teaching the technique. 4. Results take care of themselves. Game results are a byproduct of other things: how the team plays, how they adapt to the strategies of opponents, and a horde of other factors. However, if the team plays to the best of its ability, works as a team, and has the skills and techniques to use when needed, the outcome of the game takes care of itself. By focussing on winning - on results - we are often distracted from the capabilities we have to respond to the situation at hand. Each game throws up different challenges... a lot like life really. The sporting field is a good metaphor for many of life's challenges. I wonder where those "Free Tibet" t-shirts have been made... will I find a "Made in China" label? Random thought: It is easier to make our theology, perception and practice based on two or three lines in scripture. Much more difficult to base it on lines running through scripture. With so many different signals available to us each day, we learn to switch off - we can become oblivious to noises, sights, even smells while we focus on particular tasks and challenges. However, it seems there is a cost. We suffer from attentional blindness, which results in us missing key pieces of information even when we are trying to attend to it. This video shows how neuroscientists have demonstrated how this phenomenon occurs, and shows one way in which one can increase attention to notice things that we often miss. The research shows how our brains become overstimulated and therefore less sensitive to shifts in information. Through prayer and meditation, the mind becomes more alert and more sensitive to the information around us - there are physiological changes which take place. Perhaps Spurgeon was right when he said that he was so busy that he needed to spend the first three hours in prayer! Here's a few nifty little computer quirks which you can use to amuse and confound... Some conspiracy theorists might get some ammunition in the process! then press ENTER and see the magic.....! MENSA is an organization whose members have an IQ of 140 or higher. A few years ago, they had a convention in San Francisco, and several members lunched at a local cafe. While dining, they discovered that their salt shaker contained pepper and their pepper shaker was full of salt. How could they swap the contents of the bottles without spilling, and using only the implements at hand? Clearly this was a job for Mensa! "Ma'am," they said, "we couldn't help but notice that the pepper shaker contains salt and the salt shaker.."
"Oh," the waitress interrupted. "Sorry about that." She unscrewed the caps of both bottles and switched them. who spin dreams of wonder and majesty in their minds. and from abandonment of this call to make things new. and the wonderment of us all. The search for a "magic bullet" is a legacy of the twentieth century. During the early years of the new millennium, this quest has morphed into a search for a "theory of everything", which seeks to explain all physical phenomena by a single theorem. It is an exercise which surfaces in strange forms across the public landscape. In recent times we have seen the impact of this thinking in relation to climate change, water shortages, and Indigenous Affairs. Although an evidently complex search, the 'theory of everything' approach in public life is attractive, as it is easily saleable. The industrial era introduced us to the concept of economies of scale, in which it was recognised that the cost of production of any particular item could be reduced by manufacturing in larger quantities. Over the course of the past century we have consequently seen the proliferation of mass production, initially in the manufacturing industry, then spreading out into farming, health care, and human services. It has become accepted lore that the most economic and efficient answer to any problem lies in finding the correct solution which can be replicated on a large scale. The Internet maintains its effectiveness and integrity by disaggregation: breaking up its major functions across a wide range of smaller users. It is less vulnerable to attacks or problems at a single point, which, even if effective, are more likely to reduce its effectiveness than destroy it altogether. Disaggregated solutions are anathema to governmental thinking. In the past six months we have been introduced to solutions for power generation, carbon reduction, increased water security and, most recently, Indigenous disadvantage, through the attractiveness of the "magic bullet" - a public policy theory of everything which addresses the (complex) problems and offers a digestible solution which appears simple and reasonable, and ultimately saleable. The push for nuclear energy production within Australia makes an interesting starting point. We are so locked into the notions of economies of scale that the idea of building another (or a series) of large-scale electricity production centres seems the only sensible (and economic) answer. But what if we adopt the internet approach, which recognises the advantages of disaggregation, and the potential infrastructure already in place? There are literally millions of household roofs around the country which make ready mounting points for solar panels - millions of local collection and generation points which are capable of feeding power into a local network, bringing the places of generation and consumption much closer, and obviating the substantial loss of power (up to 80%) over the length of transmission lines currently in place. This disaggregated and connected approach has the added advantage of making the power generation process much less vulnerable to the types of outage we experienced in January of this year. Whilst the cost of solar panels is presently relatively high, the economies of scale arising from such increased production and technological development will inevitably reduce the unit cost over time, as well as increased effectiveness and efficiency arising over time. The cost of developing nuclear power stations and other conventional options for mass generation requires billions of dollars of investment over many years, technology which is locked in for a generation or more. Such massive forms of technology are less easily upgraded. By way of contrast, I have upgraded my modem and computer twice since first accessing the internet over a decade ago. The historic separation between places of production and places of residence is already breaking down, flowing from the advent of the internet and the ability for many to telecommute. Why not add breadth to this experience by building on the potential productive capabilities of the home in relation to electricity generation? In stark contrast to the NIMBY response to nuclear power stations, solar panels are welcomed and much more likely to be a GOER (Generated On Every Rooftop) option. Much like the introduction of pay television, and (hopefully) high-speed broadband, a GOER philosophy is ideal for progressive roll-out. The magic-bullet approach has also been well-rehearsed in our responses to the current drought. As we seek to 'drought-proof' our future, the major focus has been on large-scale solutions, culminating with last week's announcement of a major desalination plant by the State Government. Left to one side has been the capacity of local and disaggregated solutions to ameliorate the significant problems. Writers in this publication in the past week have drawn attention to the significant water run-off wasted in our urban centres. Discussion of grey-water alternatives has also sidelined, making way for the theory-of-everything approach garners the headlines. Acknowleding that a range of encouraging small-scale moves have been undertaken in local water collection in recent times, little public energy is expended in developing workable and replicable models of small-scale, local solutions, beyond the introduction of water restrictions. When the solution to such problems is cast in terms which require billions of dollars of expenditure in large-scale single-location facilities, the general public is both disempowered in its response and marginalised in the debate. Such paternalistic positioning also creates a disconnect between the problem and the solution. The contribution of the average citizen - who is responsible for energy and water consumption - to the solution, is primarily through taxes and charges. In contrast, when the solution is disaggregated and localised, the citizen's connection is enhanced. Those who have to rely on tank water have developed a greater connection in understanding and behaviour between drought and water usage than has the average mains-connected water consumer in the city. The impetus for lifestyle change is much more urgent where the available tank water can be easily measured and connected to individual and household actions. A further problem emerges in the public consciousness when there are quantum leaps in electricity generation and water supply capacity. When new power stations and water desalination plants come on-line, they convey the idea of a problem solved, which often reduces the urgency to change local behaviour. Disaggregated solutions, on the other hand, empower citizens to be part of the solution by contributing to the available capacity and through greater understanding of the impact individual lifestyle choices make. The converse has never been more evident than in our Federal Government's response to greenhouse emission targets: our contribution is so small that it doesn't matter. Under this logic, if there isn't a magic bullet, then the will to be involved is diminished. There is no doubting the ability of the magic bullet approach to draw attention to the problem and to provide the impression that action is being taken - witness the response to needs in Indigenous communities over this past week. This issue and the mooted action highlights the paternalistic assumptions and further disempowerment at the most crucial level of all - where behavioural change needs to take place. At the same time it diverts attention away from similar problems in the wider Australian community. The internet has become the most powerful means of communication yet devised, and one of the most effective and pervasive vehicles of social transformation. It has proved to be adaptable to change and improvements in technology, whilst at the same time one of the most difficult to regulate and control, because of its disaggregation. It continues to power forward because of the level of ownership at the grass roots. It is a lesson governments do well to learn as they seek to tackle the significant social and environmental issues of our time. The old dictum "You won't solve a problem by using the same thinking that created the problem in the first place" offers a timely reminder for a fresh approach. The most powerful movements in history have arguably been grass roots movements. In the face of the present enormous challenges which identify quantum shifts taking place in the environment and the community, our government needs to be embracing quantum shifts in the way it addresses the challenges. The people stand ready, able and capable of being part of the solution. I recently ditched the 2GB USB key on which I stored key files to be carried around, in favour of a pocket hard drive with a 160GB capacity. Needing files in a number of different places, and an ability to work on them in-between, the pocket drive offered greater flexibility, and was not as easy to misplace. I thought I had solved my file-portability and accessibility problems... until... I tried to move a 4.5GB file onto the pocket drive to transfer to another computer. Despite the drive indicating it had 114GB of available capacity, each time I attempted to copy the file over I encountered a message indicating insufficient space. I tried every trick I new. I ran scandisk, chkdsk, defragged the drive, created a new folder, deleted some files, but still the same message appeared, and I remained flummoxed. Then I looked at the file structure of the disk: FAT 32. In case you didn't know there are three available formats for a drive: FAT 16, FAT 32, and NTFS. The two FAT systems carry a maximum capacity for a single file of under 4GB (2GB for Fat 16). Consequently the drive was unable to accept information in a single file which had a size in excess of the drive's capacity limits. There was only one solution: to convert the drive to NTFS. It's an interesting word, "convert". It's home ground is in religious circles, when there is talk of someone being "converted". And in this computer world, it carries the same connotation: a converted drive was enabled to receive information which it was previously; it resorted the information it already knew to fit the new paradigm; its capacities were expanded, and the holes in its capacities were made smaller (one of the unique aspects of NTFS over FAT 32 is that it can use file clusters more efficiently, effectively increasing capacity), to mention just some of the implications of the change. It also loses the capacity to communicate with some operating and computer systems which cannot recognise NTFS (dos systems in particular), which is often an effect of conversion in the religious world too. My greatest fear as I set out to convert the drive file systems was the loss of data altogether. Fortunately this was not the case. Some of us are more lineal and logical in our thinking, others are more adept at the visual and creative. Try this little exercise and see how your brain responds to images and translates them into words and ideas. You've got three seconds to tell someone about knowing the will of God. What do you say? Here's one answer: "It is God's will that you cannot say anything meaningful about God's will in three seconds." Read the author's original comment when caught off guard by the question. Matt Glover lets the distinction between emerging and traditional church dissipate as he ponders his journey through intensive engagement with both in a post entitled Why I chose NOT to critique the emerging church. There are millions of different expressions of church, and I like some far more than I do others. But that doesn't make them any more or less church. I'm fairly certain that the expressions I struggle with, God likes quite a lot. I'm absolutely certain that the average guy that I meet down the street who has no church experience couldn't care less about what form a church takes. We Australians like to think of ourselves as larrikins and rebels, but the truth is we're a bunch of sheep. This nation is one of the most overgoverned and overregulated on Earth. Foreign visitors often comment with surprise on local behaviour such as compulsory voting, almost unknown elsewhere in the civilised world, and pedestrians' reluctance to cross against the red light, even when a road is empty of traffic. Here's a well-thought out Missional Apologetic Manifesto. John Smulo has a rather more discomfiting description of what it means to "be like Jesus"
The Apostle Paul spoke of Christmas in terms of 'In the fullness of time God sent forth a son, born of a woman, born under the law'. While at new year, time is on our minds, we reflected on what this "fullness of time" meant for us... Is it to 'live a full life'? to be overloaded with responsibilities and pressures? are we lulled into believing that God wants us to live to the max, stress levels at their optimum, if not their maximum? I know we're not American, but haven't we bought into the idea that any idiot could be President - the notion that the world is waiting for us to seize the opportunity and maximise our potential? Is that what 'abundant life' is for the christian? We spend so much time looking for the mountaintop experience that we never get to enjoy the meandering path through the valley, considering it to be God's gift to us. Instead, we are looking for the next path up the slope, missing the precious gifts flying and walking by us on the journey. To live an ordinary day... could this be God's desire for us? And how then do we do it? Remember those "Magic Eye" pictures which create a 3-D effect when you stare at them long enough? Well, they've made their way into cyberspace, with enough to send you into a trance for a long time. Point your browser here.